"“I wonder how the book got to Guernsey? Perhaps there is some sort of secret homing instinct in books that brings them to their perfect readers.”January 1946: London is emerging from the shadow of the Second World War, and writer Juliet Ashton is looking for her next book subject. Who could imagine that she would find it in a letter from a man she’s never met, a native of the island of Guernsey, who has come across her name written inside a book by Charles Lamb…. Ummmm, I kinda want to start writing letters to everyone I know, maybe even people I don't know. I really like books that are written in a series of letters*. This one was no exception. You get to know the characters in such a different way, little by little and through the eyes of someone else. Also you only know as much as each individual letter-writer, so there is always a suspense, an incomplete picture of the story. This book also makes me want to start a quirky book club. 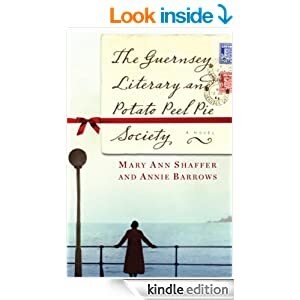 I'm not sure that I have any idea how to go about doing that and I may already have too much going on this year but I loved reading about the meetings of the Guernsey Literary and Potato Peel Society. Finally, this book has inspired me to finally read Wuthering Heights. This will be the year that I finally read it. I know I have a copy on my bookshelf upstairs, yet I have resisted reading it for years. The time has finally come. I love the story of how Annie Barrows helped Mary Ann Schaffer to complete the book when she could no longer write. It somehow felt right that this book required a group effort. What an inspiring book. I highly recommend it and am already planning to purchase a copy as a gift for a fellow lover of books and letters.